We just have to share a wonderful email that we received from a woman named Dianne, about a young reader's experience with our first book, SMASH: TRIAL BY FIRE. Mason is nine, in my daughter's 4th grade class, and carpools with our family to school in the mornings. We practice spelling words and math flash cards in the kitchen before the carpool as a way to get the kids ready for their school day. Mason had no problems with flash cards, but struggled mightily with spelling words. We practice the week's assigned vocabulary every morning to prep for Friday spelling tests, but when he gets his tests back, his scores are often 10/20, 12/20, maybe 13/20. But Mason said that he wasn't bothered by his low spelling grades because he didn't really like to read anyway. Well, I was on my way to the library to pick up some books I had on hold and I resolved to find something that Mason would like to read. In the graphic novels section I picked up some Marvel books, a retelling of Tom Sawyer, and Smash. 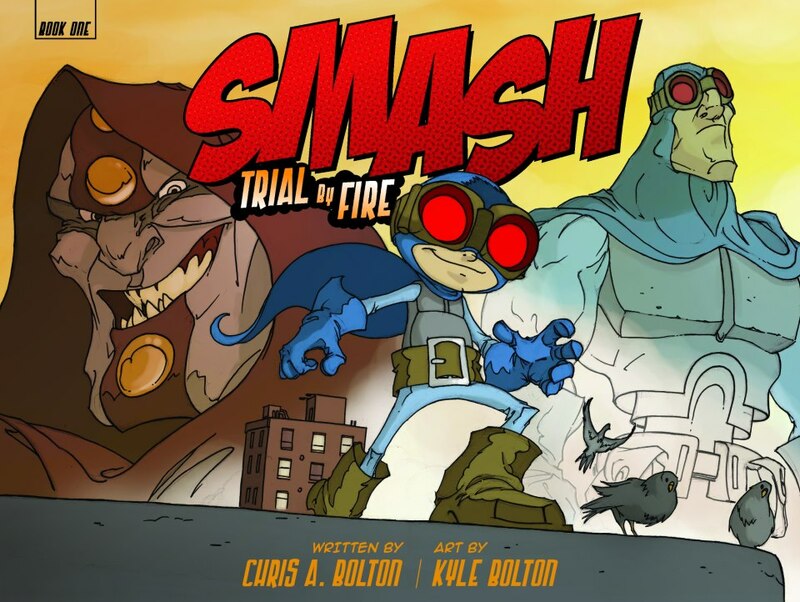 Now here's what I like about Smash, for a boy like Mason, who says he doesn't care about reading, and struggles with 1st-grade vocabulary: The protagonist is his age, the premise of small kid as super hero is immediately sympathetic, the dialog text is easily legible, the vocabulary is easy to grasp through context but not dumbed down. From the moment I showed Mason your book and he began to understand the characters and story, he was hooked. Even though a single page spread could take him 15 minutes to read, he was committed to learning every word. We used his enthusiasm to encourage his vocabulary list practice: if he would spell five words from his list correctly, he could read Smash until the carpool left for school. He did this for the entire month, and I'm proud to say that this morning he finished the entire book. He was so proud of his accomplishment. My husband made a list of the new words he learned as he encountered them in Smash and read them on his own. In addition to finding that he really does like to read, Mason has also dramatically improved his spelling performance. Last Friday was the second Friday in a row that he achieved a spelling test score of 20/20. It's amazing to see the transformation in his results, but more importantly in his recognition of what he can accomplish. Thank you for writing such an amazing book and for providing the catalyst that is changing this kid's educational direction. Thank YOU, Dianne! In our eyes, Mason is a champion and what he achieved is on a par with anything Smash can do. Your email made our day, our week, maybe even our year. It's always gratifying to know the hard work we put into a passion project like Smash pays off in dividends with young readers. If you want to send us your story or ask us a question (we'll answer 'em! ), email us at smashcomic@gmail.com. Replies guaranteed!